Rheumatism: Are Arthritis and Rheumatism the Same Thing? Rheumatoid arthritis is a type of arthritis that is often categorized as a form of rheumatism. Rheumatism is a term that was used in the past to describe a variety of conditions that have similar symptoms. Today, doctors arrive at more specific diagnoses of the rheumatic diseases and do not use the term rheumatism as a diagnosis, but rather as a description for a group of similar conditions. 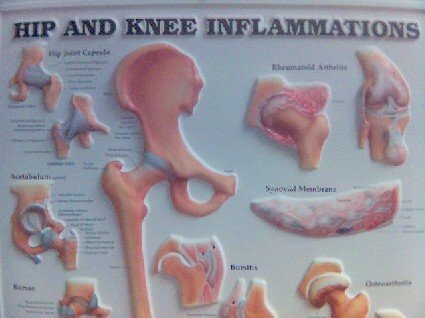 Rheumatic conditions cause inflammation in the muscles and joints and can potentially lead to cartilage and bone damage. Rheumatism is a general term that describes these conditions. The result is often chronic pain, swelling, and soreness in the joints and surrounding areas. Symptoms of rheumatism can sometimes make it difficult to perform daily activities. Many patients find that their mobility, dexterity, and range of motion decreases with symptoms of rheumatism. In most cases, treatment options help patients with rheumatic conditions continue to live full and happy lives while reducing pain and managing symptoms. Rheumatic disease symptoms may worsen in response to changes in weather; especially during periods of increased humidity. Many patients also notice that their symptoms may improve with regular and moderate exercise. However, vigorous exercise has the potential to activate previously dormant disease and worsen symptoms. There are over 100 unique types of rheumatic disease, each with varying symptoms, disease courses, and treatment options. In general, all rheumatic conditions affect the musculoskeletal system which includes muscles, bones, joints, tendons and ligaments. Most rheumatic diseases are chronic and generally persist throughout the rest of patients’ lives. Some types of rheumatic diseases can go on to affect the organs and cause other conditions. Many patients can suffer from several forms of rheumatic conditions at once. These and other types of rheumatic diseases have their own possible causes and risk factors. Different segments of the population are also at greater risk of developing certain rheumatic conditions. It is estimated that approximately 50 million Americans suffer from some form of rheumatic disease. Rheumatism affects patients from all ethnic backgrounds, genders and ages. Women are more commonly affected than men in many rheumatic diseases, which leads doctors to believe there may be a hormonal risk factor associated with rheumatic diseases. This may apply in particular to rheumatoid arthritis. Many rheumatic conditions are more common in patients around middle age. The onset of rheumatoid arthritis has been seen in adult female patients as young as 30. Juvenile rheumatoid arthritis, as the name implies, is RA in children, with cases reported in children as young as 2 years old. Because the symptoms of rheumatism can be non-specific, it is sometimes difficult to diagnose rheumatic conditions. There is a lot of crossover between the different rheumatic diseases. To narrow the list of possible diagnoses, doctors must perform thorough physical examinations and ask their patients specific questions about symptoms. Doctors also look at medical history to find any potential genetic link to rheumatic symptoms. If doctors suspect a rheumatic condition as the cause of a patients symptoms, they may refer the patient to a rheumatologist (or RA specialist) for further examination and diagnosis. Depending on what the rheumatologist discovers, the patient may be sent for additional blood tests and imaging scans to help diagnose and possibly rule out certain rheumatic conditions. Rheumatism is caused by a number of different factors and depends on the type of rheumatic disease in question. Some rheumatic diseases develop as the result of wear and tear on joints that comes with age or repetitive use of joints. In other cases, rheumatism is the result of an autoimmune condition that triggers the body to respond with inflammatory symptoms. Genetics and environmental factors are thought to be the common triggers in some rheumatic diseases. Even though rheumatic conditions come in different shapes and symptoms, have different triggers and are worsened by lifestyle and environmental factors, they all benefit from early diagnosis treatment. possible. Rheumatism is diagnosed and treated by specialist physicians known as rheumatologists. These specialists see patients at all ages, and prescribe treatment based on each individual’s unique set of characteristics. Treatment options for rheumatic diseases include over-the-counter nonsteroidal anti-inflammatory drugs (NSAIDs) like ibuprofen and naproxen which reduce inflammation and relieve pain. They may also prescribe steroidal medications if symptoms are severe or persist after trying NSAIDs. Patients with rheumatic disease are encouraged to continue with regular and moderate exercise in order to maintain good range of motion and mobility. Because obesity has been shown to worsen overall health and rheumatic diseases in particular, a healthy diet is also recommended for good weight management. Certain lifestyle changes such as quitting smoking and heavy alcohol use reduce inflammatory symptoms and help improve your health. Be sure to consult with your doctor before starting any weight plan, dietary changes or new exercise regimen.